House Majority Leader Eric Cantor says Kerry should apologize for apartheid comments, while Ted Cruz says Kerry should resign. Congressional Republicans lashed out on Monday at Secretary of State John Kerry, over his remarks that Israel could become an "apartheid state". 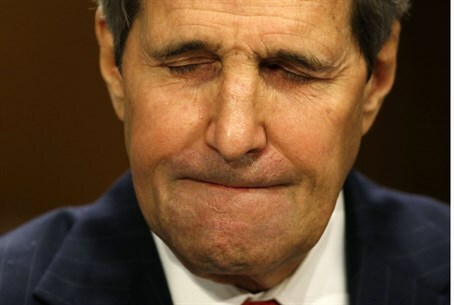 According to Fox News, the number two House leader said that Kerry should apologize for the comments, while another senator called on the top diplomat to resign. "Reports that Secretary Kerry has suggested Israel is becoming an apartheid state are extremely disappointing," House Majority Leader Eric Cantor, who is Jewish, said in a statement quoted by the network. "The use of the word apartheid has routinely been dismissed as both offensive and inaccurate, and Secretary Kerry's use of it makes peace even harder to achieve," added Cantor, who urged Kerry to "apologize to the Israeli government and people." Hours after Cantor’s call for an apology, Texas GOP Sen. Ted Cruz called for Kerry’s resignation on the Senate floor. Sen. Marco Rubio, R-Fla., a member of the Senate Foreign Relations Committee, also slammed Kerry over the reported remarks, made ahead of Holocaust Remembrance Day. "These comments are outrageous and disappointing," he said in a statement quoted by Fox News. "Incendiary name calling does not change the fundamental fact that Israel does not currently have a viable partner for peace. I urge Secretary Kerry and the administration to focus on pressing challenges in the Middle East such as ending the humanitarian catastrophe in Syria and preventing Iran from acquiring a nuclear weapon instead of pressuring Israel to make additional concessions to partners who have now chosen to align themselves with a terrorist group," he added. Meanwhile, State Department spokeswoman Jen Psaki was baffled on Monday when pressed by a reporter to explain Kerry’s remarks.